It is illegal in the state of Georgia to operate a motorized vehicle with a blood alcohol content level of 0.08%. Drivers can, however, be arrested and charged with drunk driving in Georgia if they have a blood alcohol content (BAC) of any level if they are not able to safely operate their motorized vehicle. This means to be found guilty of a Georgia DUI the state must prove that you had actual physical control of your vehicle and it was less than safe for you to drive, your BAC was above the illegal limit, or you had any level of illegal narcotics in your blood. If you were arrested for a first-time DUI in Georgia you will face the following minimum DUI penalties. Jail sentence from 10 days to 1 year. Mandatory jail time of twenty-four hours will be required for drivers who had a blood alcohol content over 0.08%. The criminal penalties listed above are separate from the additional fines and penalties which may be imposed by the Georgia Department of Drivers Services for reinstating a drivers license or the potential administrative license suspension a driver may face if they either refuse to take a BAC test or they take the test and their BAC is above the legal limit of 0.08% or higher. 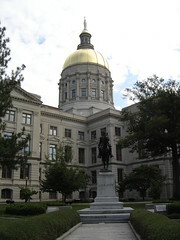 These administrative penalties are imposed regardless of whether the driver is ultimately found not guilty of a Georgia DUI. Unfortunately, if you have been arrested for a DUI and you have any type of additional aggravating factors you are most likely NOT facing the minimum DUI penalties and fines listed above. These punishments as outlined above do not take into consideration any aggravating factors such as a prior conviction, leaving the scene of a accident, failure to maintain lane, driving too fast for the conditions, having a minor in the car, very high blood alcohol content level, destruction of personal property other than their own, and loss of life. Obviously, some aggravating factors such as injuring or killing another person will have much more severe fines and penalties than those listed above, and you will not be charged with a misdemeanor. In fact, Georgias statutes allows for harsher penalties for a driver who is convicted of vehicular manslaughter while intoxicated. In Georgia, a driver who causes a death while driving under the influence may be charged with first-degree vehicular homicide, a felony carrying up to fifteen years in prison contrasted to a potential second-degree vehicular homicide and one year in jail if they kill another person while committing a moving traffic violation and they are not intoxicated. Drivers may be able to fight a DUI alone without legal help from a DUI lawyer in Georgia but if you have any type of aggravating factors it is a good idea to meet with a lawyer.